"I thought SIUE came out and just played harder," said Eagles' head coach Greg Todd. "I knew this was going to be a tough task coming in but once the lights clicked on for us in the second half I was pleased with the way we finished the ballgame." SIUE found the bottom of the net early-and-often as they built a nine-point advantage after the opening quarter and held onto it until halftime. The host team hit on 11-of-22 (.500) shots from the field, including three triples and 10 makes from the charity stripe. Morehead State struggled offensively in the first quarter, falling behind 15-6. Senior guard Miranda Crockett scored all six points in the opening quarter. The Eagles offense managed to find some life I the second quarter but still trailed 35-26 after the opening 20 minutes. In the third quarter, the Cougars opened with a 7-2 run to pull ahead 44-28 and force a timeout call by Morehead State with 6:49 remaining in the period. The Eagles answered of the timeout with 10-straight points over the next 3:04. The exclamation of the comeback came when junior guard Aliyah Jeune knocked down a 25-foot triple just before the horn to pull MSU within three at the end of the quarter. The run continued into the forth as McGowan scored the first four points of the quarter to put the Eagles ahead for good. Crockett led Morehead State with 24 points on 10-of-16 (.625) shooting. The Martinsville, Va., native jumped Robin Harmon (1978-82, 1,599) and Tasha Gales (1999-03, 1,602) to fifth on the Eagles' all-time scoring list with the performance and now has accumulated 1,616 points in her career. Crockett also extended her streak of 10-plus point games to 26 in-a-row. "Miranda was our steady constant this game," said Todd. "She was able to make a lot of big shots when we needed them. It's something she has done for us all four years she has been her and I couldn't be more proud of the way she leads our program." Jeune, who played 35 minutes off the bench, rained in 19 points to second Crockett in scoring. McGowan chipped in 14 points and 10 rebounds to register her second double-double of the 2018-19 season. Graduate forward McKenzie Calvert added 10 points. Senior guard Crystal Simmons-Cozar did a little bit of everything for the Eagles in her 28 minutes of action - logging five points, five assists, six steals, three rebounds, and one blocked shot. Morehead State caused 21 SIUE turnovers and won the rebounding battle 39-37. The Cougars scoring was paced by Allie Troeckler with 14 points. Morehead State returns to the hardwood on Saturday at Eastern Illinois. The Eagles and Panthers are scheduled to take the court at Lantz Arena at 2:00 p.m. ET. 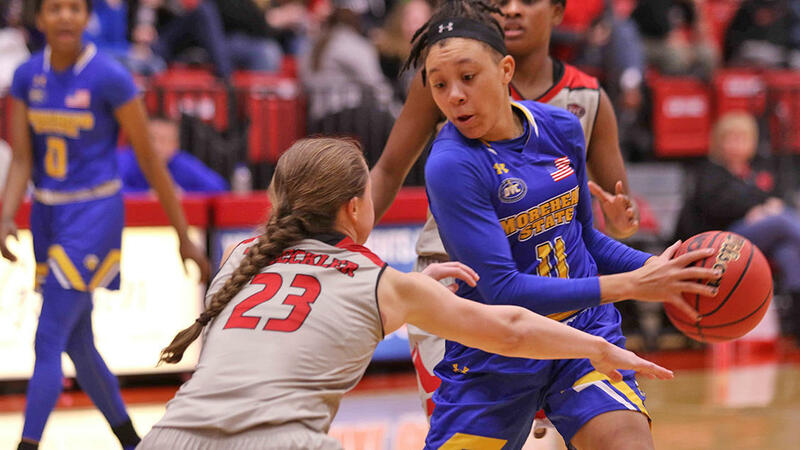 Despite firing its second-lowest shooting percentage of the season, the Morehead State women's basketball team used defense to come away with a 66-55 Ohio Valley Conference victory over Jacksonville State on Saturday afternoon at Johnson Arena. The Eagles (15-6, 6-2 OVC) shot 21-of-68 (.309) from the field but forced the Gamecocks (9-10, 3-5 OVC) into 22 turnovers as they pulled off their fifth-consecutive win. The Morehead State women's basketball team trailed by as many as twelve points in the first half before rallying down the stretch to pull off an 85-75 victory over Tennessee-Martin on Saturday evening at Johnson Arena. The win improves Morehead State to 13-6 overall and 4-2 against Ohio Valley Conference competition.